Like the concurrently released Tombstone, just as rival movies came along depicting do-gooding outlaws (Robin Hood, Robin Hood: Prince Of Thieves), computer animated insects (Antz, A Bug’s Life), or legendary marshals (Wyatt Earp, Tombstone), you wait a while for a movie about impending doom via global killing asteroids to show up at the nearest multiplex…and two come along at the same time! Moviegoers have responded to amazing thrills onscreen since the movies began, one of the earliest being The Arrival Of A Train At La Ciotat Station, which created the myth of the then-stunned audience, seeing such sights on a screen for the first time, screaming out of the theater in panic! Destruction – seen up close but at a vantage point where the audience doesn’t have to actually partake in the carnage – has always had much interest, from newsreel accounts of such early 20th Century events as the First World War and catastrophes such as the Titanic tragedy, and later commercially produced films as those based on disasters such as the 1906 San Francisco earthquake. World War II would provide pictorial horrors of its own, after which stories of war heroes and extraordinary military feats became the order of the day, in such epics as The Longest Day and D-Day, The Sixth Of June, which offered historical perspective coupled with the kind of multi-story arc narratives that would become a mainstay in the emerging “disaster movie” genre. It’s fair to say that many of the early entries in the genre were actually decent, well-made and performed films. True, the likes of Airport were based on soapy bestselling books, but the all-star cast brought gravitas and the mold was set: the film’s Best Picture Oscar cementing the fact that more of the same was to come. Leading the pack was extravagant television producer/director Irwin Allen, who long after Voyage To The Bottom Of The Sea and Lost In Space, began to mark himself out with a string of such films. The Poseidon Adventure became another critical and commercial success, leading to perhaps the pinnacle of the genre, The Towering Inferno, a “movie so big it took two studios to make!” as the publicity shouted: Allen had combined two books (The Tower and The Glass Inferno) owned by competing studios and managed to orchestrate a co-production deal between Warner Bros. and 20th Century Fox. But massive success, and another nomination for Best Picture, didn’t mean Allen’s Master Of Disaster title was impervious, and soon he had earned it for all the wrong reasons: unable to go anywhere but down after The Towering Inferno’s great heights, a run of bad TV movies (including such half-baked stinkers as Fire! and Flood! ), over the top films from rival producers (such as the pretty dumb Earthquake!) and the impact of the Zucker-Abrahams-Zucker spoof Airplane! had truly turned the genre into a parody of itself. So-bad-they’re-good clunkers like Michael Caine in The Swarm (absolutely hilarious, if you should ever get the chance to see the extended version), When Time Ran Out, with Paul Newman witnessing the end of the world, and even a return to past glories with the ill-advised Beyond The Poseidon Adventure (again with Caine) failed to stop the sinking ship. It wasn’t until a decade later, when Bruce Willis saved a group of hostages being held at the top of a skyscraper by terrorists, that the disaster movie was spoken about again in serious terms. Although the film was more of an action adventure, the similarities with The Towering Inferno and another quasi-disaster film, Rollercoaster (actually a very good thriller), had been noted in reviews, and it seemed the time was right to draw on extraordinary events surrounding ordinary people once again. That visual effects had also progressed to place these everyday folk in ever-increasingly fantastic situations with more finesse helped as well, of course, and throughout the 1990s, a hit run of action films gave audiences the same big casts and bigger explosions that they had enjoyed in the 1970s. The culmination of these elements – drawn out story strands for extensive casts of names and faces, Earth-shattering events, big explosions, comeuppance and resolve – was Roland Emmerich’s Independence Day in 1996. A clear and acknowledged homage to the disaster epics, Emmerich threw in invading aliens as the threat, and watched the money come rolling in. Just as the movie business thought big budget event films might have been a dying breed, the likes of Jurassic Park and the emergence of directors such as James Cameron and Michael Bay – boys with toys who liked to blow them up – put such films very much back on the menu. After several dubious entries early in his professional career, Bay had hit big directing exactly one of those such films, the Will Smith-starrer Bad Boys, joining forces with producer Jerry Bruckheimer and really firming up his front-line position as the ultra-modern, ultra-testosterone fuelled filmmaker of our age. Bruckheimer had been one of the 1980s producing wonders with his partner Don Simpson and, when Simpson died, brought over his company to the auspices of the Disney corporation, which had seen new management come in led by Michael Eisner and Jeffrey Katzenberg, his old partners at Paramount. Bruckheimer always had an eye for marketing his titles – one of the reasons he remains as successful as he does – and a big part of that was tapping into the recurring musical theme of a movie and turning it into a music video, and therefore promotional friendly, hit single. Bay, a previous video director, proved to be a perfect match, and their success with The Rock, an otherwise fairly routine action drama, meant they could next make whatever they wanted. With the likes of Titanic proving audiences were hungry for more world-shattering events tinged with emotional subplots and visceral visual effects, Bay and Bruckheimer announced that their intention was nothing less than the end of the world. On film, of course. Bruckheimer and Bay’s weapon of choice was a giant “global killer” asteroid, though the thing that threatened to wipe them out first was the DreamWorks studio, who had their own asteroid picture in the making, Deep Impact. Although the press and audiences liked to play up the similarities between the two pictures, neither could be said to be the same: Deep Impact is a more thoughtful film that pretty much saves the pyrotechnics until the climatic moments, while a film that sports the name Armageddon could never be anything less than a gung-ho blast from start to finish. Actually, the topic had been explored in film before, in another of the so bad it’s good disaster flicks of the seventies, 1979’s Meteor, an Irwin Allen film in all but name in which Sean Connery played the brilliant mind trying to convince the authorities that the end of life on Earth was imminent, then later the man they turn to in order to find a solution. All three films base their answer on blasting the offending rock from the sky before it hits us, though in Meteor nothing much happens, and even then it all happens offscreen! Both Deep Impact and Armageddon choose to send rockets into space that will latch onto the asteroids and destroy them from the inside out, shattering them to pieces before they can do the same to us. Unlike the two other films, Armageddon does all this right there onscreen and – don’t laugh – does so fairly believably for a film of this type. With such an event coming as something as a shock to NASA, there isn’t a team available at such short notice that can navigate themselves towards the asteroid, drill down into its core, and blow it to bits, so the task falls to “the best oil man in the business”, Harry Stamper (Bruce Willis), and his motley crew of foul-mouthed drillers. Actually, they’re not that foul-mouthed, nor unhealthily inclined, since the amount of money Disney was putting up for the film meant that Bruckheimer and Bay would have to concede to making sure the film was family friendly in order to recoup its costs. In many ways, it’s this excising of any risqué material that makes Armageddon so compelling and appealing to older family audiences. It takes itself seriously, of course, even if the events are completely over the top (“basically the worst parts of the Bible”) and the whole endeavor is painted with as broad strokes as possible. The film was such a colossal hit in the summer of 1998 that I doubt many people haven’t either seen it on the big screen or at home, and although some raised eyebrows at the inclusion of Armageddon in the prestigious Criterion Collection, I for one could see the value in opening up the list of titles to include such well-crafted blockbuster fare. Armageddon is just one of those films where everything works, from the perfect note performances from the prerequisite bunch of names and faces actors that were all just in the right place at the right time with the right look, to the sprawling, multi-narrative script (by, among others, a pre-Lost JJ Abrams), production value that Bay and Bruckheimer were able to bring to the project, and the finishing touches that only a host of amazing visual effects houses could provide. The economic storytelling, in which the asteroid is discovered in the first few minutes (with a nice prod at the same summer’s Godzilla), we meet the members of Harry’s crew and their mission is set up and rolling before the 30 minute mark, is a casebook example of the modern day (or should that be Bay?) blockbuster. 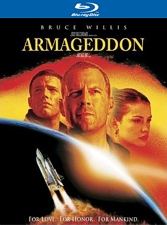 At two and a half hours, Armageddon does lag a little once one of NASA’s two rockets inevitably falters and the team finds themselves split on other sides of a rock (“the size of Texas”), but it gets back on track once they have to make a choice whether to stay and destroy the rock or attempt to return home, leading to a charged climax which Bay plays for all its worth. A huge part of these closing moments, and the film’s extended successful marketing, comes with the layering on of another Diane Warren super-ballad, here performed by Aerosmith. I Don’t Want To Miss A Thing not only kept thoughts of Armageddon in everyone’s minds during its original run, but became a huge hit in its own right, continuing another Bruckheimer template that he would only go on to beat with How Do I Live from Con Air later. In fact, if there’s anything that can be leveled at Armageddon, it’s precisely that it set up the “rules” of almost every major event movie to follow. The sheer brassiness of the script, the sheen of the production, the movie’s percussive music score and staccato editing have now not only become de rigueur in just Bay or Bruckheimer’s films, but in just about ever other modern day Hollywood blockbuster too. The pair has never since equaled their collaboration here, and although Bruckheimer goes from strength to strength, producing the Pirates Of The Caribbean trilogy for Disney and two of their tentpole pictures for 2010 in Prince Of Persia and The Sorcerer’s Apprentice, Bay has slid into a recurring circle of making the same movie over and over. Since Armageddon, we’ve had the folly of Pearl Harbor, a film that attempted to mix Armageddon with Titanic only for it to sink quicker than the luxury liner, another Bad Boys and the awful noise of two Transformers movies. The only real film of note has been The Island, a box-office disappointment but actually a very well crafted thriller (even if certain elements were said to be lifted from a much earlier film). Bay has elsewhere given himself over to producing remakes of slasher and horror films to various degrees of success; unlike the knowing Dark Castle films from Robert Zemeckis and Joel Silver, Bay’s remakes can be pretty nasty films. As such, Armageddon seems to be the anomaly in Bay’s career. Bruckheimer has always seemed to find the balance between loud, flashy heroics and some form of emotional resonance, but one has to wonder what kind of legacy Bay hopes to leave behind or where his career is taking him. With more Transformers and Bad Boys still to come, there doesn’t seem to be the kind of variedness that a good director – and Bay can still chose to be a great one if he desires – needs. So it’s fortunate that the stars aligned for Armageddon, a big, dumb Hollywood blockbuster of the sort that hadn’t really come along before, but would leave its indelible mark. The real-life horrors of 11th September 2001 made some of the shots seen in the modern disaster movie all too real, and the brakes were applied to such films in the short term following those events. Perhaps as a way to divert our attentions away from such memories, and point towards the growing issues with the environment, disaster epics now often call upon nature to provide the threat of extinction. If there’s one film that has come close to matching the best of the genre, it’s Roland Emmerich’s 2012, though even if the spectacle is greater (and certainly more definable than The Day After Tomorrow or any other of the director’s films), it can’t quite match the lean, and sometimes intentionally cheesy, storytelling of Armageddon, nor the digital work that, at the time, blew us away with its astonishing depiction what the future of the movies looked like. Coming to Blu-ray for the first time, Disney seems to be on a bit of a kick at just putting out basic, bare bone vanilla discs of some of their more popular catalog titles at the moment, simply mirroring their original DVD counterparts in a lack of extras or new features. And let’s make it clear here that this is the Touchstone Home Video release of Armageddon. Although the film was selected as one of Disney’s films from this era to receive the full-on supplement laden Criterion Collection treatment, none of those extensive supplements have been included this time around. The highlight of the Criterion disc was the addition of several minutes of footage spliced back into the movie by Michael Bay, who was one of the many voices who provided excellent audio comments for that release. We have to make do with the original theatrical cut here, but one area where this edition leaps over the Criterion is in the picture department, a new 1080p HD transfer replacing the non-anamorphic letterboxed widescreen of the earlier disc. However, it’s not as stand-out astounding as one would be expecting, and this can’t even really be put down to the vintage of the film. 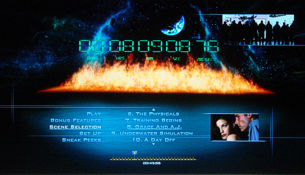 There was some speak a couple of years ago that Armageddon had never properly been mastered for HD release, and that the original film elements had been lost to a fire in a storage vault. 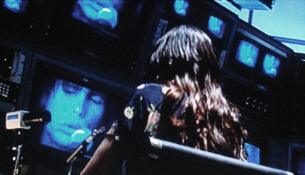 Director Bay often suggested the film would never make it to home video again, or would be some time in the offing, since visual effects would have to be recomposited, and the film effectively reassembled from scratch. With that in mind, one has to wonder how this release has been possible, and suggestions have pointed to the studio resorting to using a safety print instead, which would certainly explain the lack of super-sharpness and stability lost from not pulling the images from the original negatives or interpositives. During the HD-DVD and Blu-ray Disc wars, Bay was a huge proponent for Sony’s BD technology, but I’ll bet even he won’t be too pleased with the way his movie looks here. It’s actually none too bad if one takes in the claims of the fire, and better to have it on disc than not at all, though I don’t see why it should be quite so filtered looking at times and will undoubtedly be just that little bit disappointing for fans who will rightfully be expecting reference quality demo material. You would hope that making up for it would be an excellent soundtrack, but even that seems a little flat even given the DTS-MA room to breathe. The original mix was a theater shaking experience, typically exuberant in that Bay/Bruckheimer/mega budget way, but here, from good old Chuck Heston’s opening narration onwards, there’s a distinct lack of really good, heavy bass. Pumping up your woofer will help, but this just isn’t the audio/video spectacular presentation that the film deserves. It’s also unfortunate that the Criterion edition’s extras (a full serving of deleted scenes, outtakes, storyboards, visual effects analysis and more) weren’t able to be included either, at least in this release, meaning that all we are left with are the same limited “bonus” features that featured on Touchstone’s original DVD release: namely an Original Theatrical Trailer, an additional Teaser Trailer and the “MTV Award-Winning Music Video” for Aerosmith’s anthemic I Don’t Want To Miss A Thing, which if it’s still not blaring away in your minds from the original airplay it got back in 1998 will be again soon after playing this disc (and has added poignancy, of course, due to the Liv/Stephen Tyler connection, with the video mirroring the father/daughter dynamic). All of them do their thing well, though only in standard definition interlaced 4:3 letterbox. Also bundled on are previews for the upcoming Disney/Bruckheimer Prince Of Persia and The Sorcerer’s Apprentice adaptations, the terminally unfunny looking When In Rome, the recent Bruce Willis thriller Surrogates and a Blu-ray promo. The packaging is as simple as can be: a slimline BD case holding the sleeve art that again basically replicates the previous release, without any inserts or reverse sleeve printing offering chapter stops; the disc art following Disney’s usual half-blue/half-poster split down the middle design. I expect that these releases are being promoted more towards those that own these titles already but wish to own the movie itself in HD. If that’s the case, then the Armageddon Blu-ray does the job, even if in a pretty unspectacular and basic manner. Knowing that there’s a feature-packed edition on DVD that contains an extended cut of the motion picture, one would have to tread very carefully in outwardly recommending the purchase of this disc without adding the caveat that, in all likelihood, a better edition may find its way to disc in the future. Perhaps it’s the extended cut that Bay insisted would have to be recompiled, in which case perhaps this is simply the best that can be achieved at this time? Even so, there are many supplements from the Criterion edition that would have made this a more attractive upgrade, and the lack of these along with disappointing image quality that isn’t as superior as it should be does put a definite alert note on the title. For a film that made such a huge impact, perhaps a rental is the best option, just to catch up with Armageddon again. I would certainly expect it to be revisited again in time, but for now this almost vanilla disc won’t end your world, but it may rock it. Gently.